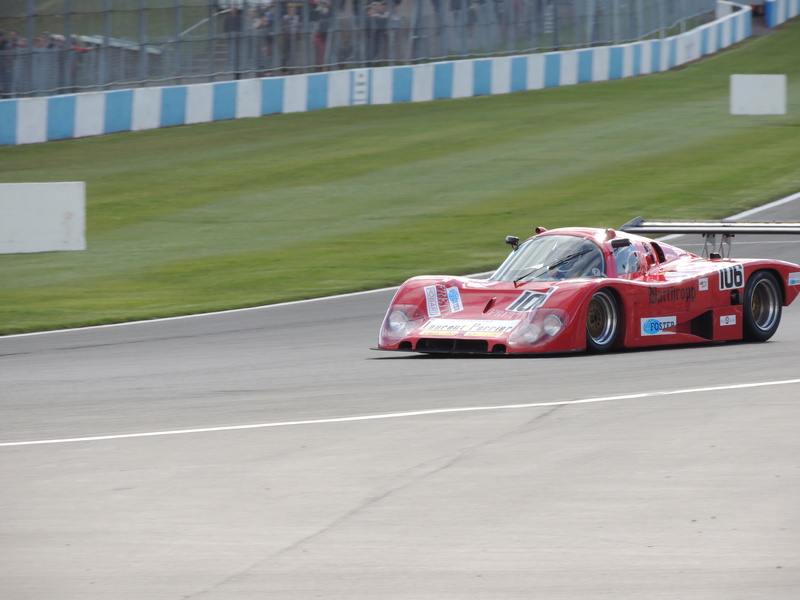 Now in its third year, the Donington Historic Festival is cementing itself as a well-regarded historic race meeting. 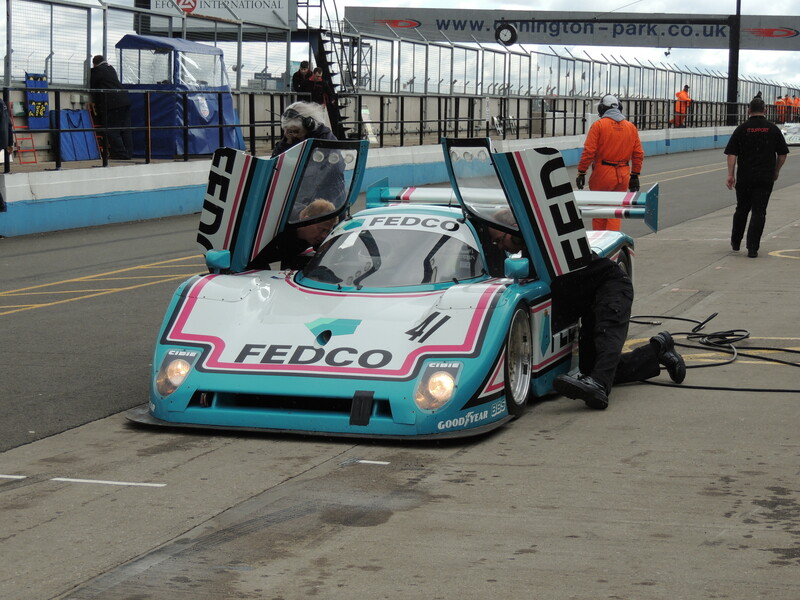 In the scribes opinion this event should have the potential to establish itself as large as the Silverstone Classic. The entries are there, and the venue is one of the most historic in the UK. 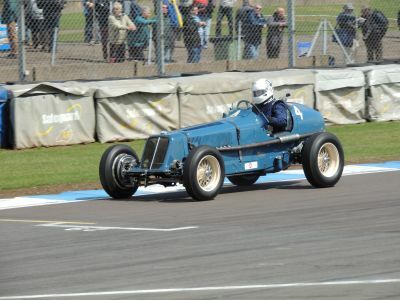 It is been organised conjunctly between Donington Park and Historic Promotions, which is a good blend as both have a vested interest in ensuring historic motor sport reaches the public at large – the circuit owner (who wishes to attract as much attention as possible to their venue) and the event organiser (who has their business interests at stake). 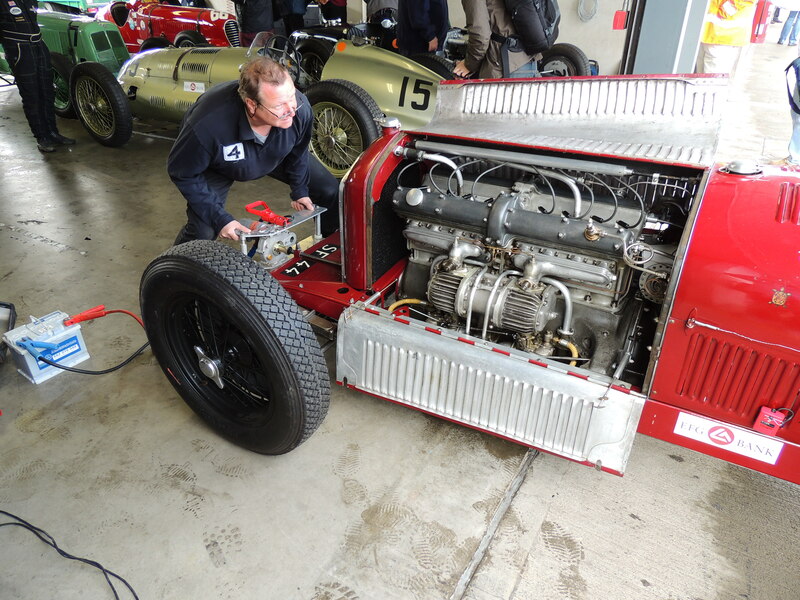 Over 400 entries across twelve fields, from pre-war through to Group C sports cars. The scribe obtained media accreditation for this event, allowing him to attend in front of the trackside wire fencing to take some good happy snaps. The media centre facility at the circuit was quite well set up with tea/coffee facilities and light snacks, staffed full-time, and had laid out documentation including abundance of programmes, schedule, press releases and circuit map. Event results – qualifying lap sheets & grid sheets where posted on the wall, and in this area is where the organisers would occasionally display “Bulletins”. The bulletins obtained information such as entrant withdrawals and reasons for DNFs. The room, which overlooked the main straight (adjacent to race control), also included free Wi-fi. An initial wander around the paddock area is always warranted, somewhat of a recognisance mission. What an eye-opener. The quality of cars racing here was just as good as at the Goodwood Revival in 2004 (last time the scribe attended a UK/Europe event). The Historic Grand Prix Cars Association (HGPCA) purchased a grid and promoted the “Nuvolari Trophy for pre-1940 thoroughbred Grand Prix cars”. What a field; two P3 Alfas, a Monza Alfa, the Parnell MG, Maseratis, and no less than 7 ERAs. 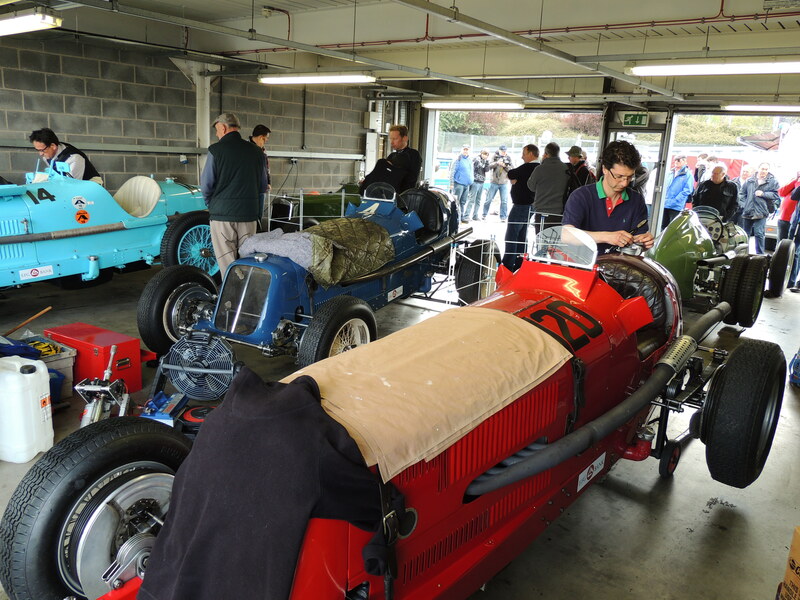 And of course, Bugattis too, including Nick Mason’s T35B (campaigned by Charles Knill-Jones). It was an ERA benefit for the weekend with R3A of Mark Gillies & R10B of Paddins Dowling occupying the top two places in both races. Gillies just far too quick against Dowling, who was not hanging about. Dowling would keep on his tale for the first few laps, but knowing that he would not get close enough, chose to back off as lapped traffic came into play. 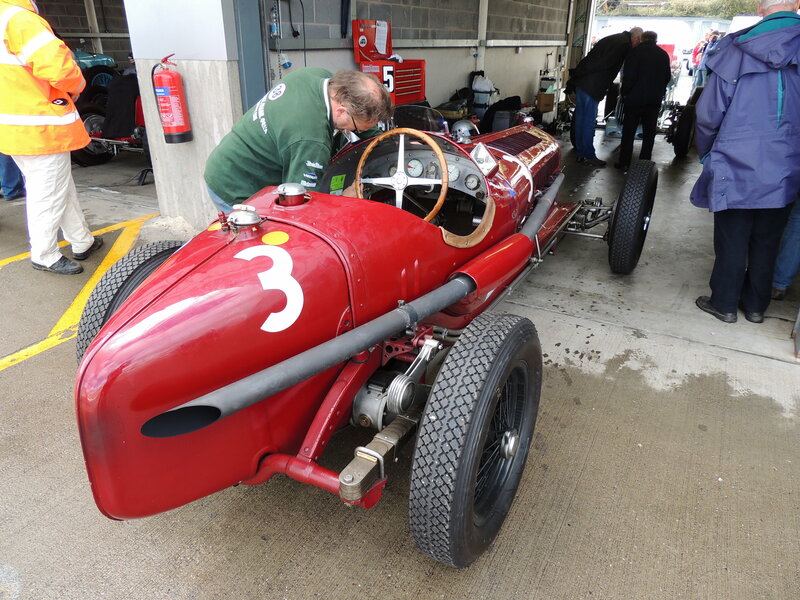 Callum Lockie took third in his Maserati 6CM. Duncan Ricketts in ERA GP1 had an ‘all-nighter’ Saturday night replacing a broken diff, replacement works carried out with no assistance. Storming through the field, he retired during lap 3. Six of the first seven places in the second, and final 25-minute race for the Nuvolari Trophy were taken by ERA, with Lockie’s Maserati holding on to third. Charles McCabe finished 4th in the ex. Bira & Lindsay R3B ‘Remus’, rapidly showing signs that he will be a front-runner in the near future.AJM1, R4A & R9B filled 5th to 7th with Tony Smith taking 8th in his P3 Alfa. 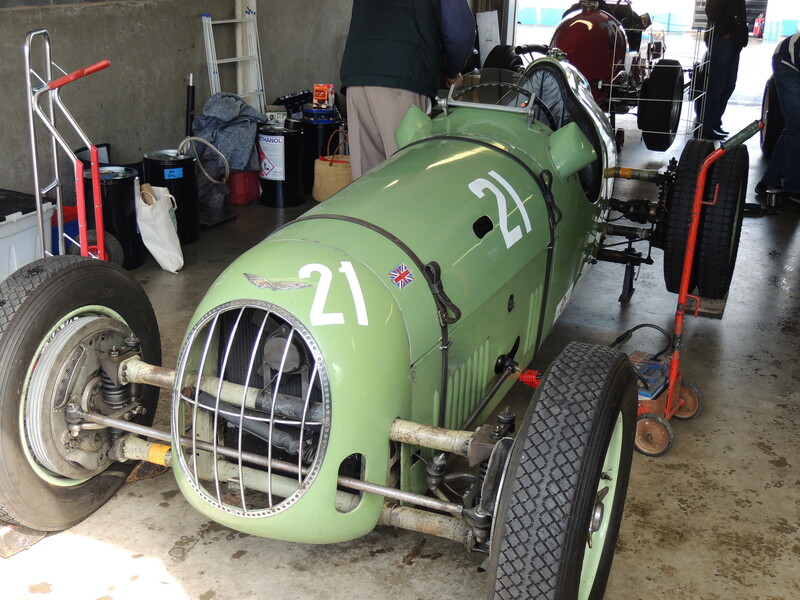 In cidently, this car is the P3 that Nuvolari won the 1938 Donington Grand Prix. 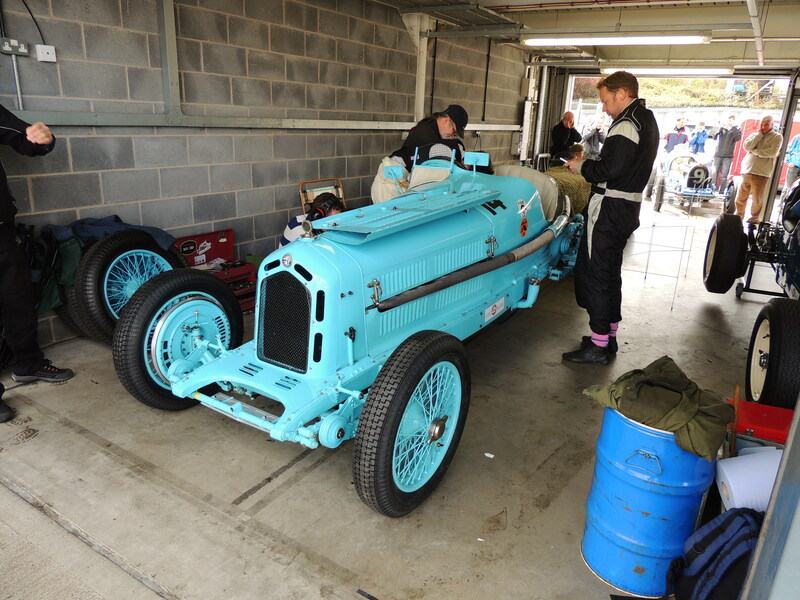 This car was also driven in period by Reg Parnell, and sone Tim was on hand to see the car for the first time in many years. You’ll find him about to sit on the front left tyre in one of the photo galleries. In Australia we have Group S for production sports cars, which is made up of cars from the late 1950s-mid-1970s that conform to eligibility criteria to represent cars from that time. 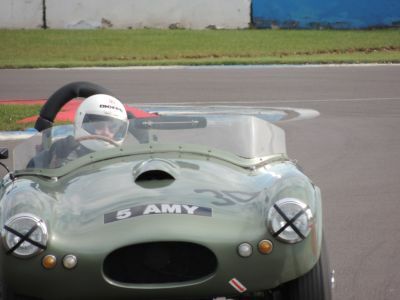 Guess the UK version of this has to be the ‘E-Type Challenge’ with all cars conforming to a strict criteria & having to visit parc-ferme after every track session. John Pearson won the first race by a country mile, but took second in race two following a terrific battle with Martin O’Connell. Saturday afternoon saw the first of the 1 ½ hour endurance races, and this race for Pre-63 GT cars provided quite a spectacle. You would think that after such a long time the race would fizzle out and become boring, well not in the UK with the way these guys drive. 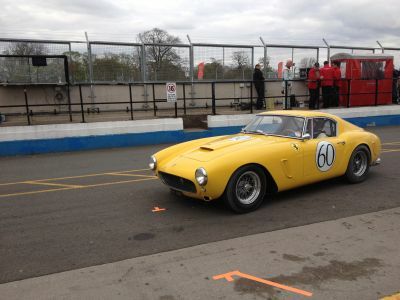 The expected winner coming into the race was the Ferrari 250 SWB entry with Le Mans legend Jackie Oliver and Gary Pearson at the wheel. Not one, but two tyre punctures with Oliver at the wheel (rear-right both times) forced them to finish in 8th, but after the first they managed to get back to 3rd behind the Aston Martin’s. Gary Pearson had swapped cars at this point and taken over the wheel of Carlos Monteverde’s Aston Martin DB4. Nick Naismith (competing in a solo drive) overtook the Monteverde/Pearson DB4 in his Aston Martin DB4 to storm home to victory after 51 laps, a winning margin of 3.4 seconds. You can also tell those who take it seriously and those who don’t with their pit stops! With an entry list that included multiple Jaguar D-Type, Aston Martin, Maserati 300S & A6GCS, Cooper-Jaguar, Cooper-Bristol, Lister, Ferrari 750 Monza, Austin-Healey (with 100S & 100M), Frazer Nash and a Cunningham it was to be an absolute highlight for the weekend, so the scribe positioned himself on the outside of the chicane that enters on to the main straight. The one-hour race that Saturday afternoon did not disappoint with a race long, close fought battle between two of the D-Types, both of which were co-piloted by Gary Pearson. The Pearson brothers fought for lap after lap at the beginning of the race, and Gary was the first to pit where he handed over to Monteverde, then taking over from John as he pitted shortly after. Monteverde drove the wheels off the ex. Jim Clark D-Type to take the flag after 41 laps from the Pearson car some 17 seconds back. 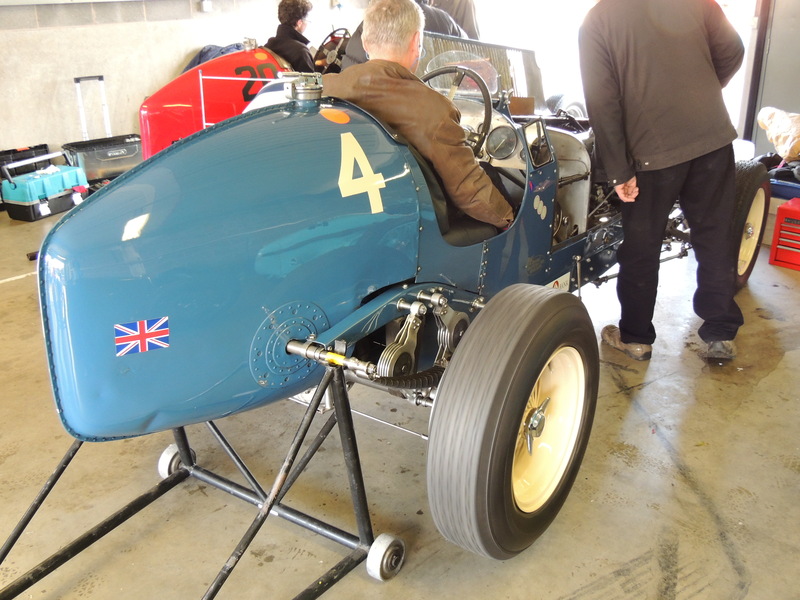 The sports-car bodied Cooper-Bristol (one of two in the race) of John Ure & Nick Wigley came home in third. 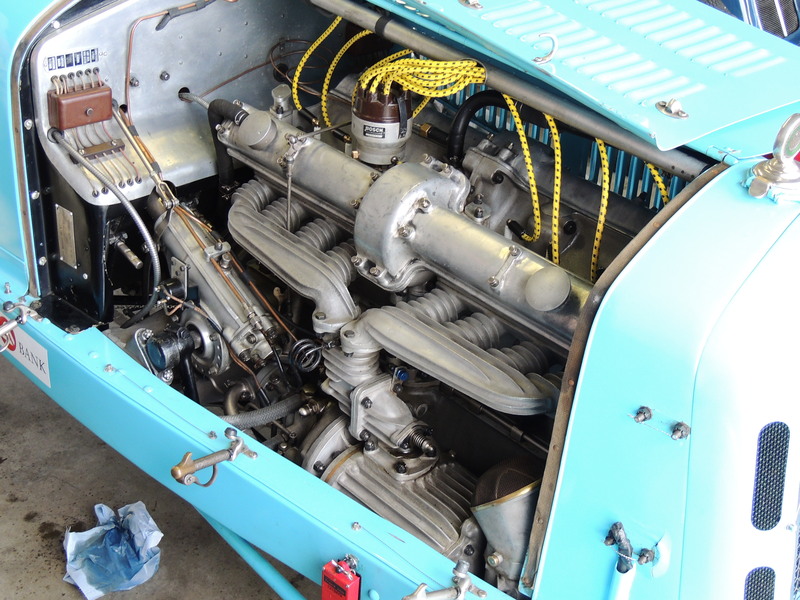 A third D-Type took fourth from a Maserati 300S. 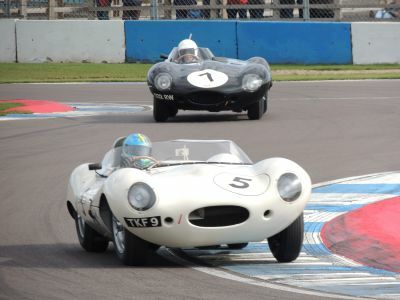 staggering too was the average lap speed across the race for the Monteverde/Pearson D-Type was 90.73 MPH. The untimely death of Mini driver Christian Deavoux in the pre-1966 touring car race Sunday afternoon led to the cancellation of the remainder of the meeting. 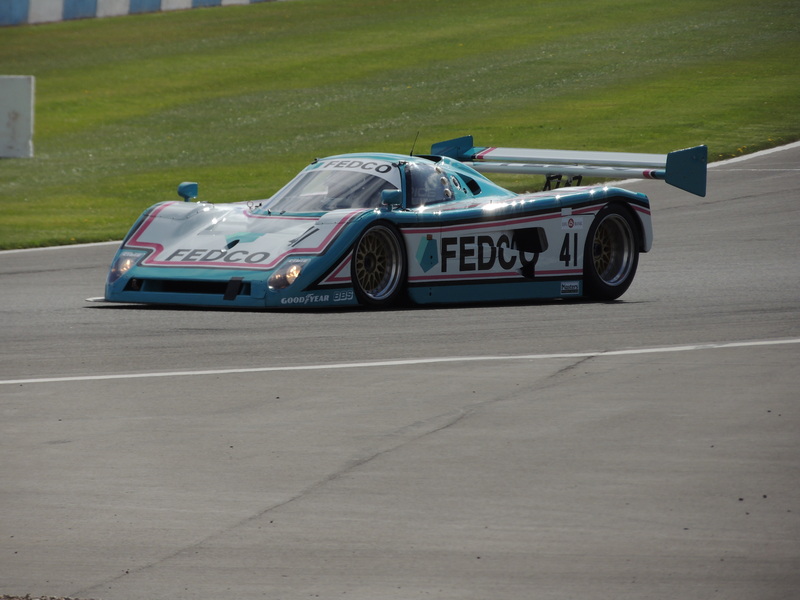 One of those races being the Group C event. Fortunately, though we got to see a rain-shortened qualifying session & the first race. Australian Paul Stubber is continuing to improve the 1985 Veskanda that he bought from John Briggs a few years back and has now finished the restoration, changed the colour to red & made a couple of small modifications, including removal of the front wing & insertion of brake-cooling vents above the front wheels. Amongst a small, but quality field this work had him qualify in second place, ahead of Spice, Porsche, Lancia, Cheetah, Tiga, Jaguar and Argo. Gareth Evans was the only one to pip him, but when you have a Mercedes-Sauber C11 at your disposal, it’s little wonder! Evans took race one easily by 17 seconds over the first of two Spice (second and third) with an average lap speed of 107.63 MPH. Stubber spun (can’t recall which lap), but recovered to finish in fourth. 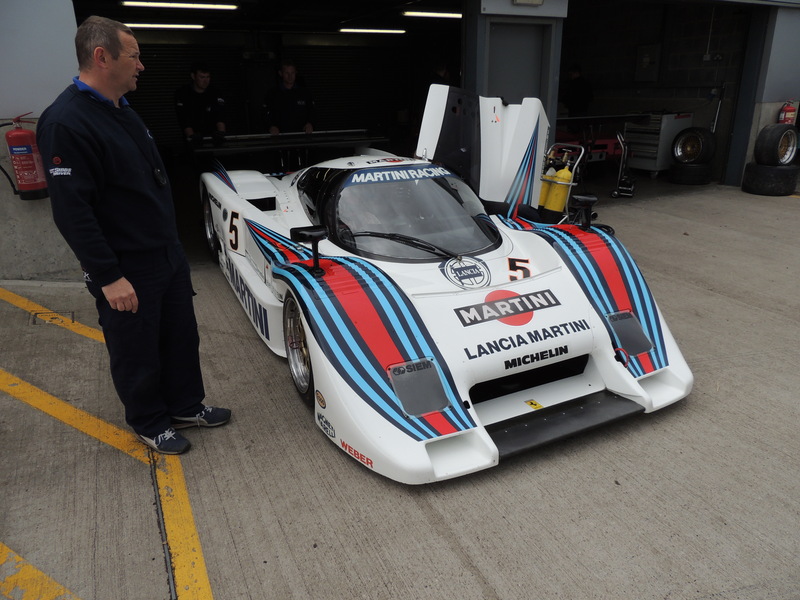 Considering the Veskanda was one of the oldest cars in the field, quite a good effort, finishing ahead of the Lancia-Martini LC2 of Roger Wills & two Porsche 962C. Another race filled with stunning cars from the period. It was a Lister affair with the Lister-Costin of Ward & Buncombe victorious over the Lister-Knobbly of Lynn (solo drive). After 44 laps the remaining 16 finishers were all lapped, most more than once. Third place went to the Champion & Stretton Lotus XI Le Mans. Belgium Gregory De Prins put in a stellar effort in his father’s Reja MkIV. 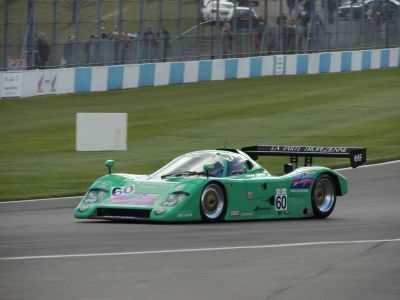 The scribe had dinner with them on the Saturday night at the official dinner and found out all about the pretty Belgium made sportscar, one of only 12 built – three entered at Donington. One of the most exciting fields to watch across the weekend was perhaps the Historic F2 races. Imagine five cars vying for the lead, lap after lap, with 3-4 entering corners at the same time on various occasions. Very exciting stuff, particularly in race one when a front runner decided to lunge their engine on the first lap, so a long period of clean up caused heaps of dust thrown up into the air after the re-start, although the leaders could not get too much of an advantage. March seemed to dominate the starting grid, and indeed four of the five top finishers with Martin Stretton & Andrew Smith battling down to the chequered flag in their March 742s, with Stretton the victor, by 0.501 seconds. Race two though was a different affair with Stretton putting in fastest lap, then retiring on lap 21, which handed over the lead to Smith, taking the win. 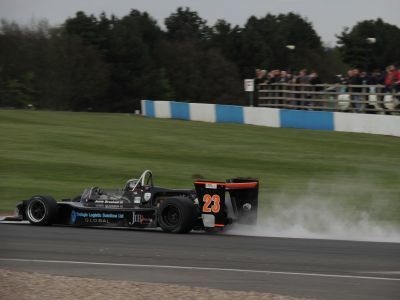 The Ralt RT1 of Nick Fleming finished second, some 3 seconds back, followed by the March 782 of Peter Mayrick some 3.2 seconds further back for third. The final endurance race on Saturday afternoon, but finishing past 7:30pm in the evening was the pre-1972 sportsracing car race. And what a sight to see all those ‘big-banger’ cars hit the track, and race. Lola T70 and Chevron B8 & B16 were the most popular cars in the field, but if you desired an SF, then why enter your screaming Ferrari 512M or a Ford GT40. Racing (like many others) a few cars across the weekend, Roger Wills, driving the sole McLaren (M1C) in the event retired on the twelth lap, but would have finished well in the top four. After 49 laps (and the sunset taking over) the Lola T70 Mk3B of Leo Voyazides and Simon Hadfield took the chequered flag, some 18.6 seconds ahead of the T70 of Stretton & Thomas. 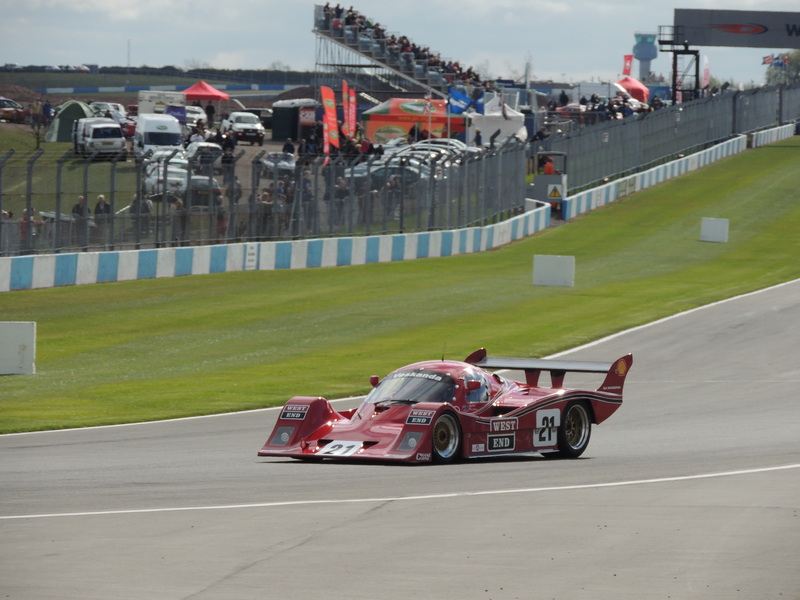 All remaining cars, including the aforementioned Ferrari 512M were lapped at least once. 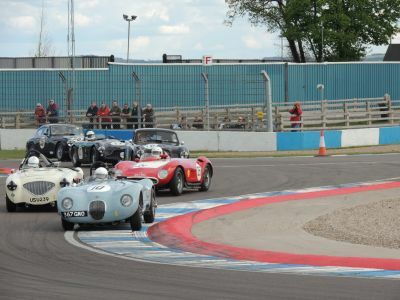 If you are planning a trip to the UK to check out a motor race meeting and want to see some proper, close historic racing, then I would strongly suggest the Donington Historic Festival. Although it doesn’t have the ambience of Goodwood Revival it has a very historic venue, and a very quality line-up, not to mention a very well managed event from an organiser’s point of view.